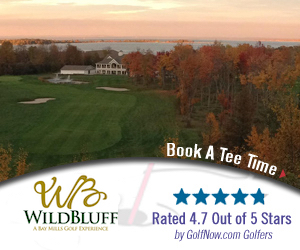 Wild Bluff offers 18 holes of championship golf, a world class double teed driving range, two practice putting greens and one green for brushing up on your chipping and bunker play. Standing high on our "top" tee of Wild Bluff's driving range is unique as you target greens in the shape of a heart, club, diamond and spade. Five sets of tees allow you to play the course length that fits your ability. All rates include cart with GPS & practice balls prior to play. Call the Golf Shop at 906-248-5860 to make a tee time. Contact Wild Bluff at Bay Mills Resort and Casino at 906-248-5860 for more information and details on holding a golf outing at the course. We want to help improve your time on the golf course. Whether you're a newbie on the golf course or an experienced golfer wanting to learn some new tricks, we can match you with a golf instructor that will help you improve your game. For lessons, contact Matthew Phipps at mphipps@4baymills.com or call Wild Bluff at 906 248-5860. Bay Mills Resort & Casino can host your wedding with up to 300 guests. Request a proposal today. This profile was last updated on 03/06/2019 and has been viewed 20,500 times.